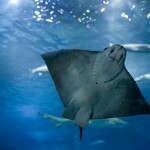 The eagle ray is a condrictious fish with a body in the shape of a flat disk (dorsoventrally depressed). The head is in the shape of a horseshoe. Its eyes are located on either side of the head and are behind the two large spiracles or holes where it collects water. It is two times wider than it is long. The tail is long and sharp, with a small dorsal fin and two poisonous needles. Its skin is viscous as it segregates a great deal of viscosity. 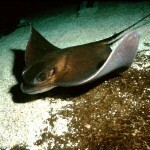 The dorsal part is dark, whereas the ventral part is whitish with a brown edge to the ventral fins. Its maximum size is 1.5 m long and 80 cm wide. It has a solitary behaviour. They are carnivorous animals that feed on crustaceans, molluscs and fish that live on the floor, which searches by excavating with its fins and forming characteristic holes in the sand. Its teeth are specialised in easily grinding shells of clams and other molluscs. It has oviparous reproduction (it incubates its eggs in its uterus). The gestation period lasts 6 to 8 months and each female gives birth to between 3 and 7 offspring. They usually reproduce in spring, near the coast. They usually live near the surface and sometimes jump out of the water. Although it is easy to find them on sandy or muddy beds up to depths of 30 m.
The eagle ray lives in areas of temperate, warm waters in the Mediterranean and the Eastern Atlantic. How you seen how it swims? 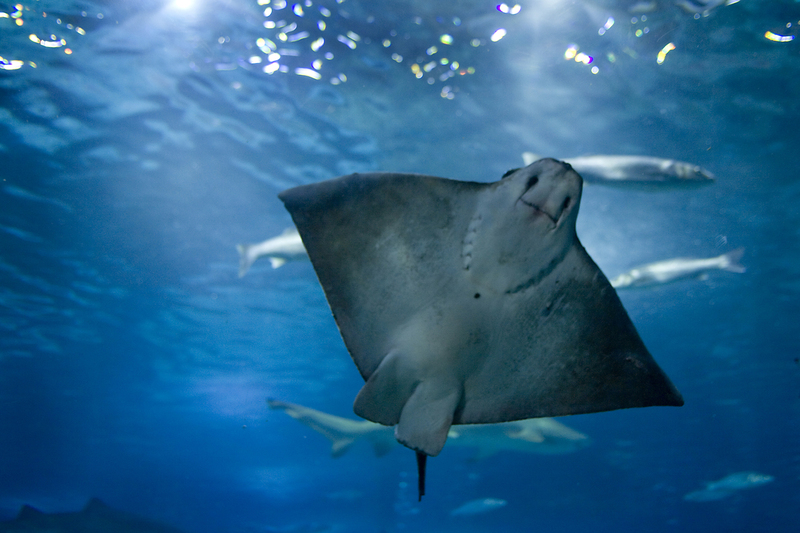 Its swimming is highly characteristic, as it makes movements with its pectoral fins similar to those of a bird.